Wearable Bioelectronics presents the latest on physical and (bio)chemical sensing for wearable electronics. It covers the miniaturization of bioelectrodes and high-throughput biosensing platforms while also presenting a systemic approach for the development of electrochemical biosensors and bioelectronics for biomedical applications. 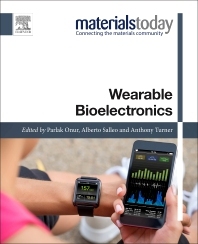 The book addresses the fundamentals, materials, processes and devices for wearable bioelectronics, showcasing key applications, including device fabrication, manufacturing, and healthcare applications. Topics covered include self-powering wearable bioelectronics, electrochemical transducers, textile-based biosensors, epidermal electronics and other exciting applications. Alberto Salleo is currently an Associate Professor of Materials Science at Stanford University. Alberto Salleo graduated as a Fulbright Fellow with a PhD in Materials Science from UC Berkeley in 2001 working at Lawrence Livermore National Laboratory on laser-induced optical breakdown in fused silica. From 2001 to 2005 Salleo was first post-doctoral research fellow and successively member of research staff at Xerox Palo Alto Research Center, where he worked with Bob Street on device and materials physics of disordered and polymeric semiconductors. In 2005 Salleo joined the Materials Science and Engineering Department at Stanford as an Assistant Professor. While at Stanford, Salleo won the NSF Career Award, the 3M Untenured Faculty Award, the SPIE Early Career Award, the Tau Beta Pi Excellence in Undergraduate Teaching Award and the Gores Teaching Award, Stanford’s highest teaching honor. Prof. Salleo is a Principal Editor of MRS Communications. Onur Parlak is a postdoctoral research fellow at Stanford University, Materials Science and Engineering. He received his PhD degree in Bioelectronics from Linköping University, Biosensors and Bioelectronics Centre in September 2015. Earlier, he was visiting research intern at Nanyang Technological University, Materials Science and Engineering Department, Singapore in 2011. He received his master and bachelor degree from Izmir Institute of Technology, Department of Chemistry in 2011 and 2009, respectively. Dr. Parlak’s research in Stanford University focuses on wearable biosensors for early diagnosis of metabolic disease, and energy devices for wearable bioelectronics.